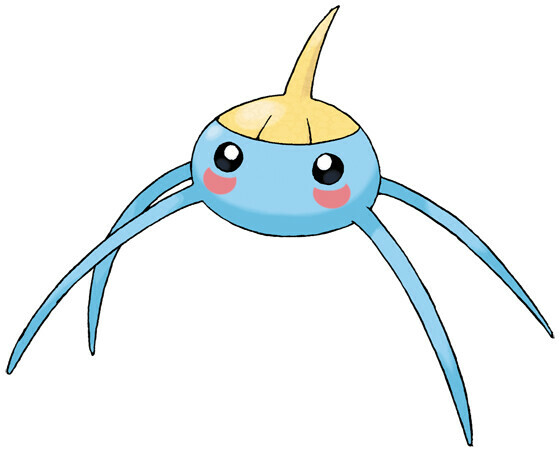 Surskit is a Bug/Water type Pokémon introduced in Generation 3. It is known as the Pond Skater Pokémon . The effectiveness of each type on Surskit. In Generations 3-4, Surskit has a base experience yield of 63. If it’s in a pinch, it will secrete a sweet liquid from the tip of its head. Syrup made from gathering that liquid is tasty on bread. It lives in ponds and marshes that feature lots of plant life. It often fights with Dewpider, whose habitat and diet are similar. Surskit learns the following moves in Pokémon Ultra Sun & Ultra Moon at the levels specified. Surskit learns the following moves via breeding in Pokémon Ultra Sun & Ultra Moon. Details and compatible parents can be found on the Surskit egg moves page. Surskit can only learn these moves in previous generations. It must be taught the moves in the appropriate game and then transferred to Pokémon Ultra Sun & Ultra Moon. Surskit learns the following moves in Pokémon Sun & Moon at the levels specified. Surskit learns the following moves via breeding in Pokémon Sun & Moon. Details and compatible parents can be found on the Surskit egg moves page. Surskit can only learn these moves in previous generations. It must be taught the moves in the appropriate game and then transferred to Pokémon Sun & Moon. Problem in Pokemon Ruby: Masquerain or Shedinja? Net Ball + Surskit =? Can I catch surskit in emerald?if so how? ?